When:Saturday, February 23rd. Doors 6:00, Show 7:00 PM. Details:Join us for this one night only showing of Far Out at Switchback Brewing Co! 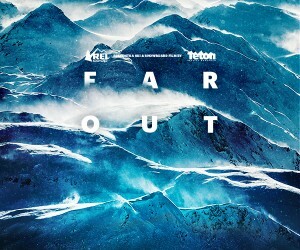 Get ready, Burlington, TGR is returning to town with our latest film, Far Out! Tickets can be purchased at the Switchback Tap Room. About the film: Far Out embodies the imagination as much as it does a physical space. It is the quest to seek out undiscovered realms and inspire new waves of creativity, enlightenment, and progression. It is the quest to be blown away. Join the TGR crew on one of it’s boldest missions ever. The film follows the perspective of an athlete as he embarks on a journey to one of the most remote and unexplored mountains ranges on the planet, the Albanian Alps. While the final destination itself appears to be the ultimate goal, it is the collective of athletes, experiences, and the array of locations around the world that inevitably drive the seasons adventure. Witness mind-bending pillow lines as the crew camps out deep in the Purcell Mountains of BC, experience urban madness in Kamchatka and the insanity of the Crazy Mountains in Montana. Join the crew in the Slovenian Alps for over-the-head cold smoke, watch an 11year old rip Jackson Hole, discover the alien landscape of Girdwood, AK in January and see Sean Jordan ride into Crested Butte on a Black Stallion to shred the Southern Rockies. Find out if the wildest and most untamed mountains in Europe let us in, and if the ultimate destination became a reality. Also check out the Ode to Muir Tour!